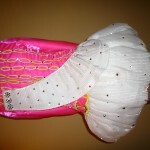 Stunning 2 yr. old Siopa Rince dress in pink twinkle satin with white plisse skirt. 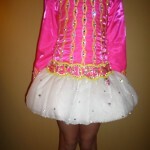 Hundreds of Swarovski crystals create beautiful stage presence The dress is 2 pieces–a jacket and an underslip/skirt. There is no room in this dress for let out or let down. 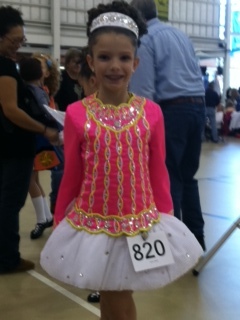 Perfect dress for a petite 8-10 year old dancer. Great first solo dress! Stored in a smoke and pet-free home. Asking Price: $875.00 or best offer. Price includes shipping in the US, extra shipping to other countries. I will accept returns and refund the cost of the dress, buyer to pay all shipping costs.